One hell of a jam session—that almost didn't even happen. Stevie Ray Vaughan and Jeff Healey Play "Look at Little Sister"
A rarely seen video of Healey taking part in a Stevie Ray Vaughan and Double Trouble performance in 1987. Three blues guitar greats in top form. What else do you need, really? Some rare footage of two blues guitar masters at work together. Watch Stevie Ray Vaughan, B.B. King and Albert Collins Play "Texas Flood"
"One hundred percent Vaughan,tubeybite, lots of attack, warm—extremely fat and thick but still has top-end bite." An incredible piece of blues—and music—history recently surfaced online. I know, I know. 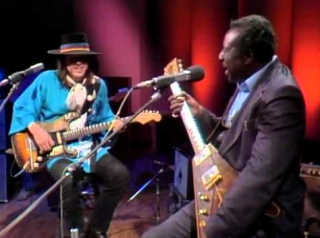 Die-hard Stevie Ray Vaughan and Jimmie Vaughan fans—myself included—have already seen this video 49.677777 times. Lost Stevie Ray Vaughan Song? Check Out Doyle Bramhall's "Chateau Strut"
It’s been 33 years since Stevie Ray Vaughan hit the world stage, becoming the hottest thing to come out of Texas since J.R. Ewing. Shortly before Stevie Ray Vaughan's tragic death in August 1990, he and his big brother, Jimmie Vaughan, recorded Family Style, their first album together.